There are two cruise terminals in Sydney Australia. They are about 30 minutes from the international airport. 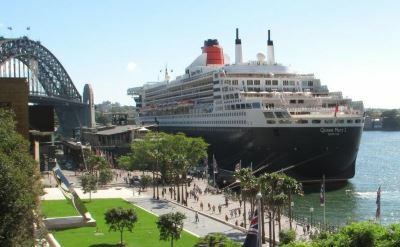 The "Overseas Passenger Terminal" at Circular Quay: This terminal has an excellent location in the middle of Sydney's action. There is a cafe in the terminal and the Rocks shopping district is nearby. Circular Quay trains and ferries are about a two-minute walk from the terminal. There is no parking available on-site. 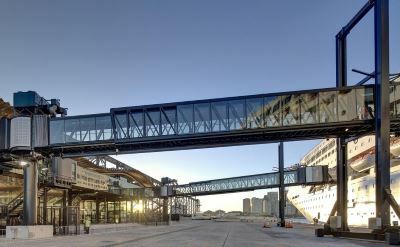 The "White Bay Cruise Terminal": This cruise terminal is a modern facility designed to speed passengers on and off the ship. Passenger drop off and pick up is available at the terminal, and short-term parking for passengers is available on-site. Long-term parking is not available on-site. Give yourself plenty of extra time for travel to and from this terminal.